1. So—you’ve gone and started a whole new time period. You write about Ancient Greece—isn’t that enough? Why? And why the later Middle Ages? Well, I’ve always loved the Middle Ages. I love chivalry, warts and all, and I wanted to write about it. And—if you follow William Gold long enough (like, into Book 2, The Long Sword) we’ll get to Greece in this period, too. But mostly, it’s about my love of the martial arts of the period. I love to fight in armour, and I love to study the period—in situ, as it were. I don’t just reenact this period. Fighting in armour with steel swords is a remarkable thing. Hard to describe. But very good for fitness, and very—exciting. 2. The Ill-Made Knight reflects some very uncomfortable truths about the Middle Ages, doesn’t it? It does. I have a degree in this period; I’ve always loved it, but it’s not a unicorns and maidens kind of love. The central fact of my beloved late Middle Ages—in literature, in war, in economics and even in fashion—is the Black Plague. A third of the population died. Next to that single event, it is hard to picture how they kept civilization together, much less went on with their lives or made great art or fought wars or even went to church. It must have been—horrible. A word too often used. Exactly. Wherein England attempted to take France by means of a war of terror—a very modern kind of war. Fought by knights who were sometimes the very antithesis of chivalric. But I’m not writing anti-heroic ‘grim reality.’ I’m really interested in genuine heroism—and what is more heroic than learning a set of ethics and sticking by them in the face of disaster and death—or even in the face of the banality of evil? I’ll be frank and say that ‘grim reality’ bores me. 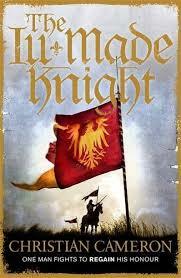 I have tried to make my vision of the Hundred Years war as authentic as I could manage; yet my story is about one of the men who rose above the ‘grim.’ It did happen. 4. You are a passionate advocate of chivalry. I am! I tried to practice it as a military professional and I still struggle live up to it. Every time I’m beaten in a match—especially when I am full of adrenaline—it takes discipline to smile and congratulate my victor. Ideals of loyalty and generosity can be the devil to adhere to in real life situations, and it is not for nothing that one of the great Medieval works of chivalry is a book of questions with no answers! 5. But you admit that most knights failed to live by the code in period. Like any ethical code, adhering to chivalry is a struggle. I’ve seen refugee columns. I’ve seen directly what happens when nation-states make war directly on civilian populations; when genocide occurs or is attempted. I think what I saw in Central Africa in the 90s informs my idea of what France—France as a failed state in 1362—must have been like. Psychology and neuroscience have both begun to give us insight into the long term consequences of trauma; imagine a war that lasted, with some very brief respites—for over a hundred years. Any rules—and rules at all, any ethics that save a few people from the slaughter or allow a spark of compassion to exist—are better than no rules at all. The knights and men-at-arms who attempted to abide by the rules must have been better men. And let me say—I probably say this too often—that we could look at the 20th century and—eying the statistics—say ‘Democracy is the leading cause of war in the 20th century’ or ‘Democracies are evil—they killing innocent people.’ Every system fails. We can look at the failures, or we can examine the successes. That said—I still believe, as Richard Kaeuper, my mentor in University, taught me, that despite its best efforts, Medieval Chivalry caused more harm than it limited. Interesting dichotomy, eh? 6. Why did you choose William Gold? What was the spark? A few years ago I read a brilliant book by a scholar named William Cafferro about John Hawkwood, the real life Captain of the White Company. In the course of the book he describes the taking of Cesena—a serious war crime in the Italian wars when a cardinal of the church (soon to be pope) ordered the entire civilian population of a town exterminated for no better reason than that they had humiliated him. Cafferro suggests that some of Hawkwood’s men left him in the aftermath, and the dates suggest that one William Gold, a fairly senior officer, went off and fought for Venice. I don’t know if William Gold left Hawkwood because of the massacre of Cesena, but my William Gold will. At the same time—this is what I studied in university, and I was fascinated by ‘William the Cook’ and the notion that a man in the later Middle Ages so desperately wanted to be a knight. 7. You chose the title The Ill-Made Knight? It’s a pretty famous title! It’s true. It is one of my favorites from my childhood. Of course, the Ill-Made Knight of T.H. White is Lancelot. I wanted readers to see the connection, and the homage is quite deliberate. Without T.H. White I wouldn’t have studied the Middle Ages at all. In fact, we just read ‘The Sword and the Stone’ to my daughter, and I was struck every night by how much of that book I’d just—taken in. By osmosis, almost. It was perhaps the most important book of my childhood, I now realize. 8. You like to write first person. Do you identify with your characters? I confess that I identify with William Gold more than with Ptolemy in ‘God of War’ or Arimnestos in the ‘Long War’ series. William Gold has in him a number of men I respect—and a little of me. Arimnestos is modeled on some SF guys I worked with, but also on my uncle, Donald Cameron, who was a great story teller and a very dangerous man. But first person—it’s very hard. It is hard to avoid anachronism and it is fiendish to make sure that the reader understand what’s going on. In France in 1362, it was all I could do to avoid moment where some character ‘data-dumped’ a political monologue. The Paris Commune? The Jaquerie? Really hard. I hope I pulled it off. But that said—the challenge is what drives good writing, I think. Well—there’s some. It was the central reality of the thinking man in the Middle Ages—at least in the West. Most of my characters in every period are pious. Atheism is really a modern adventure. People in the past believed—or that’s my reading of history. So—Kineas has dreams and religious experience, and so does William Gold. I read a lot of Medieval theology before I wrote this book. And some Medieval Philosophy, although, to my amateur eye, they are virtually synonymous. Throw in Aristotle—see that’s research saved! (Laughs) I mean, I read Aristotle for Kineas and Alexander! 10. What are you reading now, what are you writing, and what’s up with Tom Swan? Tom Swan will ride again—or walk. He’s off to the Siege of Belgrade in 1456. That event will cover three installments, and I suspect they’ll start to appear by Christmas. I write Tom Swan for fun—and to pay for armour and stuff—so I have to work on him in the nooks and crannies between projects. Oh, and yesterday I finished Symposium III, the last chapter in the prequel to the ‘Foreworld’ project. It’s out as a graphic novel. I really recommend it to my Tyrant and Long War fans, not because I’m so great, but because Dmitry Bondarenko has done an incredible job of making Ancient Athens come to life. 11. Can we see you fight in armour? Yes. I’m a pretty middling armoured combatant—I’m old, for one thing. But my harness is good—thanks to Mark Vickers at Saint George’s Armoury, Craig Sitch at Manning Imperial, (who also makes some of my Ancient Greek harness) and Peter Fuller at Medieval Reproductions. But I’ll post a melee from a recent event on my Author page on Facebook. I want to thank Christian Cameron for this wonderful interview and for the insights into medieval life he has so kindly shared with us. I have just finished "The Ill Made Knight" last night and while I plan a full review in the next couple weeks - tentatively next Friday, September 20th, but could move to the following week - I would like to add that the novel is superb and possibly the best single work of the author as it has the most balance between action, background and world building, while the narrative flow is impeccable here without hitting any walls that stop from turning the pages, but also inviting to further research into the period. Structurally the novel starts in 1381, with William Gold now a respected and rich 41 year old knight going back to England from Italy; stopping at a Calais inn, he meets an old acquaintance and occasional rival, namely the diplomat, courtier and intrigue master, Geoffrey Chaucer (yes that one!) and a friend of his, Jean Froissart (that one too), with the French/Belgian (as we would say today, "Hainauter" as he was then) chronicler mightily interested in Gold's life and exploits. And of course, so it starts, covering briefly William's upbringing and the how and why he got to France as a 15-16 year old boy and then following his career for the next 6 years or so with much more to come as promised by the author. If after finishing the novel you read the interview above, you will be struck by how much of what Mr. Cameron told us here, is really reflected in the novel and the way William's voice presents things, showing once more the authorial capabilities of Christian Cameron in bringing an era to life and consciously reflecting on it from the outside too. I am planning to read this book at some stage and I have heard that the historical detail is excellent - particularly because Cameron knows so much about the combat of the time. I did hear though that the plot was very similar to Bernard Cornwell's Grail Quest books?